Aurora borealis and aurora australis are the northern lights and southern lights. 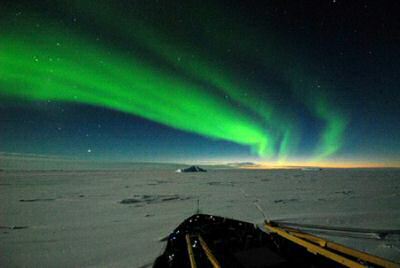 Admire the above picture showing the aurora australis above Antarctica, seen from a Japanese ship. Aurora australis is also known as the southern lights from Antarctica. It’s an atmospheric phenomenon displaying a diffuse glow in the sky in the southern hemisphere. It’s caused by charged particles from the sun interacting with the magnetic field of the earth. Aurora Australis is also the first book ever written, printed, illustrated and bound in the Antarctic. The book was written during the British Imperial Antarctic Expedition or the Nimrod Expedition (1908–09) led by Ernest Shackleton when their Antarctica expedition over-wintered at Cape Royds on Ross Island. 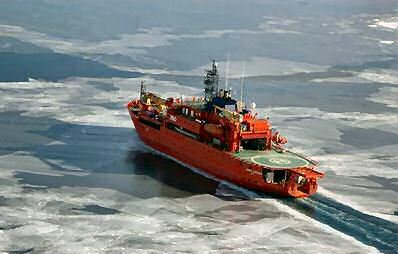 The Aurora Australis is also an icebreaker. It’s not an Antarctica cruise ship. The Aurora Australis is a multi-purpose research and re-supply ship, built by P&O Polar. It has a hangar and helideck to carry three Squirrels or two Sikorsky S-76 helicopters. Similar to the aurora australis but seen in the northern hemisphere. These are the more famous greenish "northern lights" you can witness in the night sky. Every time there is an aurora in the north there is also an aurora in the south.